It's an obvious one but try and get ahead. I am always at my most productive in the fortnight before school holidays and double the amount of work I do. Obviously, you can't get ahead with everything but I tend to schedule more blog posts and work with brands to a tighter deadline so I can complete outstanding projects before the break. I am not a fan of scheduling social media in general but I do like to do this during the holidays. I schedule 3 posts per day from my Facebook page (direct from Facebook) and use the free version of Buffer to schedule a few Tweets. It doesn't take too much time to schedule content in bulk and in advance (I can normally schedule a week's worth of content in one hour) but it takes a lot of the pressure off. I like to make the kids a packed lunch for the next day in the evening and pop it in the fridge in their lunchbox. It's one less thing to worry about and if we decide to head to the park we can just grab lunch and go. Making lunches in advance is a massive timesaver for me. I don't know how often my kids ask me for a drink when they're at home but it's a lot! I always make sure I have bottles of water on the bottom shelf of our fridge that the kids can easily help themselves to when they're thirsty. I hate working in the evening but in the school holidays it really is a necessary evil. I would say I work from 6pm - 9pm most evenings during the holidays. During this time the kids are usually ready to relax in their rooms and play on their computer/watch TV for a few hours and they leave me in peace to get on with my work. If the kids are in one of those moods where they just won't stop fighting or they are constantly interrupting you, the park is your friend. I am lucky that we have a park at the end of my street. I always have an 'outdoor adventure' bag packed and ready to go by the door. Packed with suncream, change, snacks, hats and bubbles, it's easy to add a bottle of water and go. Children can spend hours at the park and seem to behave much better there too. I take my laptop, a flask of coffee and use my phone as a WiFi hotspot. If I have a deadline and the kids aren't playing ball, a trip to the park always works a treat. If grandparents offer to take the kids to the beach for a few hours, don't be polite and decline - take them up on their offer! The kids will have fun and you'll have the opportunity to be super productive and work for a few hours without interruption. Likewise, share the care with your friends. Plan a weekly playdate circle with your friends where one parent looks after a few children for a few hours in the afternoon. The kids will be happy to see their friends and everyone gets a break. I think it's important to remember why you work from home - normally, it's so you can spend more time with your children. Don't feel guilty about spending time away from work during the holidays. You'll never get this time back. As the school holidays approach and I am negotiating new contracts, I always extend new client deadlines by a few weeks. This gives you a little breathing space. Sometimes, campaigns can be very time specific and if a client would like work to be completed fairly quickly, I normally charge a premium to do this. If you were in an employed role, you'd have to take 28 days paid annual leave per year. There is no reason why you shouldn't do this when you work from home. 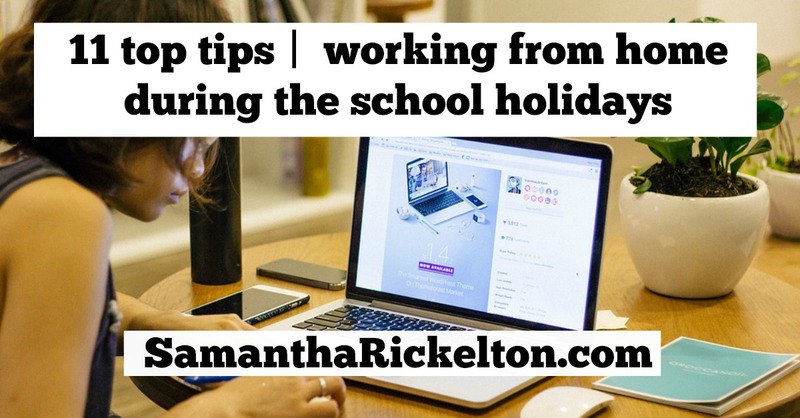 I try and take a few full weeks holiday throughout the year (2 weeks over Christmas and one week during our annual summer holiday) along with a few extended long weekends when I turn my out of office on, forget about work and focus on having fun. It's definitely worth doing this regularly to stop yourself from burning out and you'll return to work full of energy and raring to go. This is such a great list. I'm pinning it to refer to. I like the packed lunch hack, great idea. © SamanthaRickelton.com | All rights reserved.